Not only kitchen cabinet, kitchen island is also a necessary addition for your kitchen. Especially if you have enough space in your kitchen. 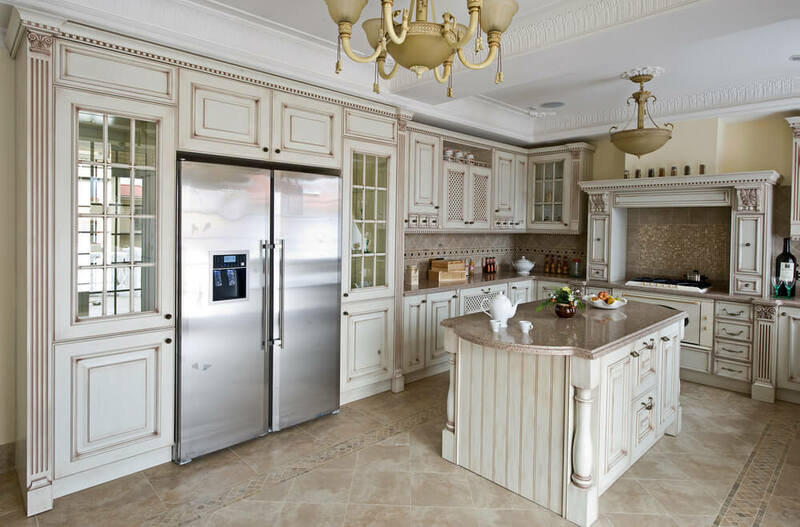 It is one of the most important furniture that will define the style of your kitchen, whether you want to have a rustic kitchen or modern and cool kitchen. That is why you should be careful when choosing a kitchen island. For people who want to have a modern kitchen, a white kitchen island with granite countertop can be a perfect idea. 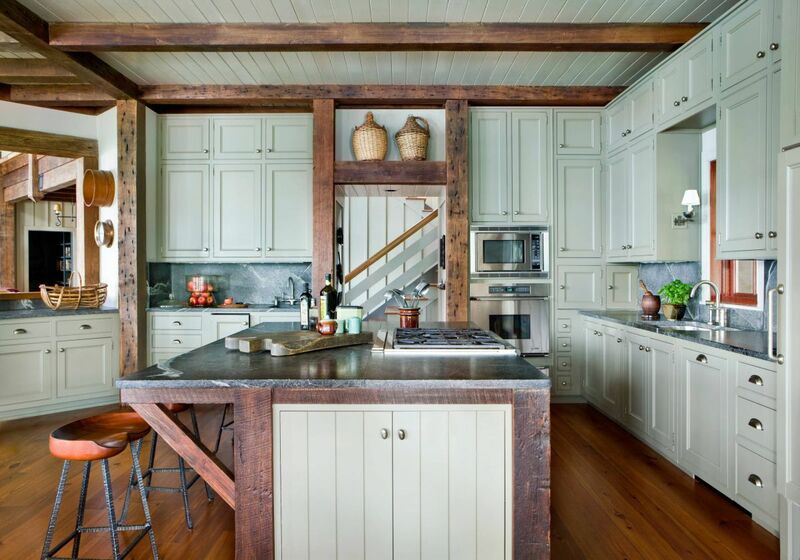 But if you want to have a farmhouse kitchen, a kitchen island with wooden countertop is the best idea. Kitchen island is not a must-have item in your kitchen, but if you like cooking and need more space to put your cooking ingredients, it is gonna be a good additional furniture. Before deciding to have or not to have a kitchen island, it is better for you to know the reason why you need a kitchen island. Because it is related to what kind of kitchen island do you need. Is it for food preparation, or for dining. 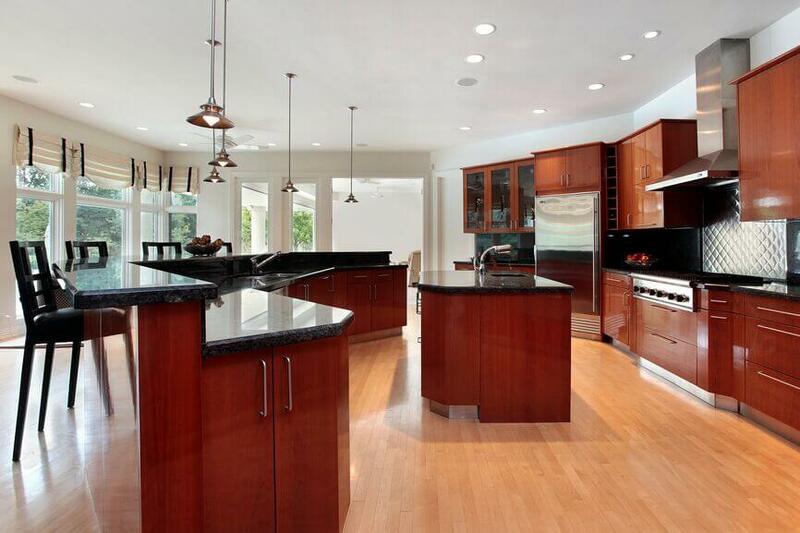 Having difficulties in finding the perfect kitchen island fot your kitchen? Well, let us take a look at these 30 kitchen island ideas for a cook wanna be. Check this out. 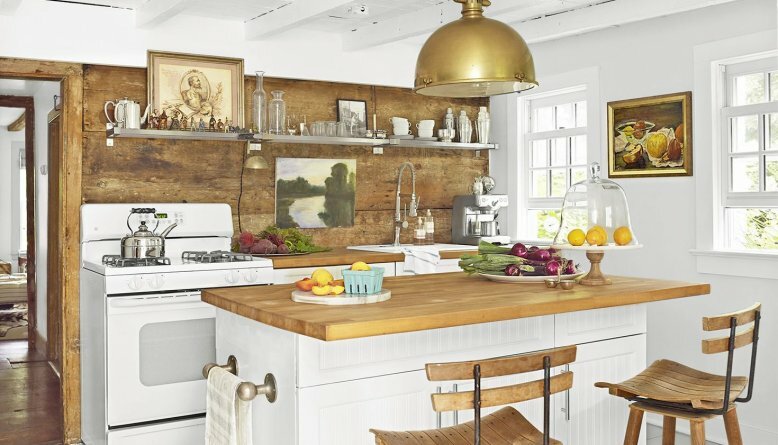 Looking for the perfect kitchen island for your rustic kitchen? Well, you can try this idea. If you already have white kitchen cabinets, and have designed your room in rustic style, you can add a rustic kitchen island with white doors and granite countertop to your kitchen. This kitchen island is not only perfect for food preparation, but also for dining too. If you want a multifunctional kitchen island, you should go with this idea. What do you think about it? 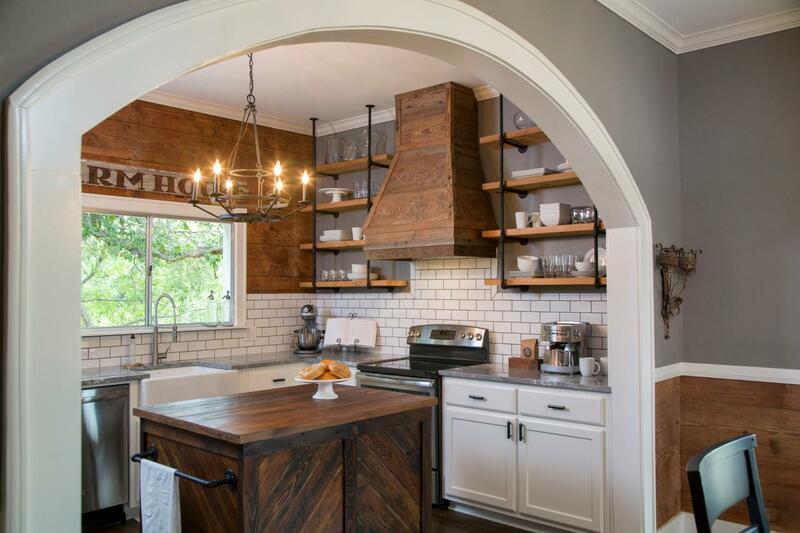 Designing your kitchen in rustic style? Well, this kitchen island can be a perfect addition. The white cabinets looks perfect with the white brick walls. 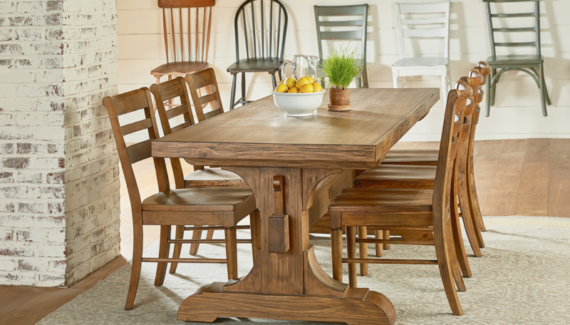 Now, you need a rustic furniture that will enhance the rustic look of your kitchen. The rustic kitchen island. You can choose a simple wooden kitchen island without breakfast bar if you only need the kitchen island for food preparation. The kitchen island looks perfect, right? Wanna try this idea? 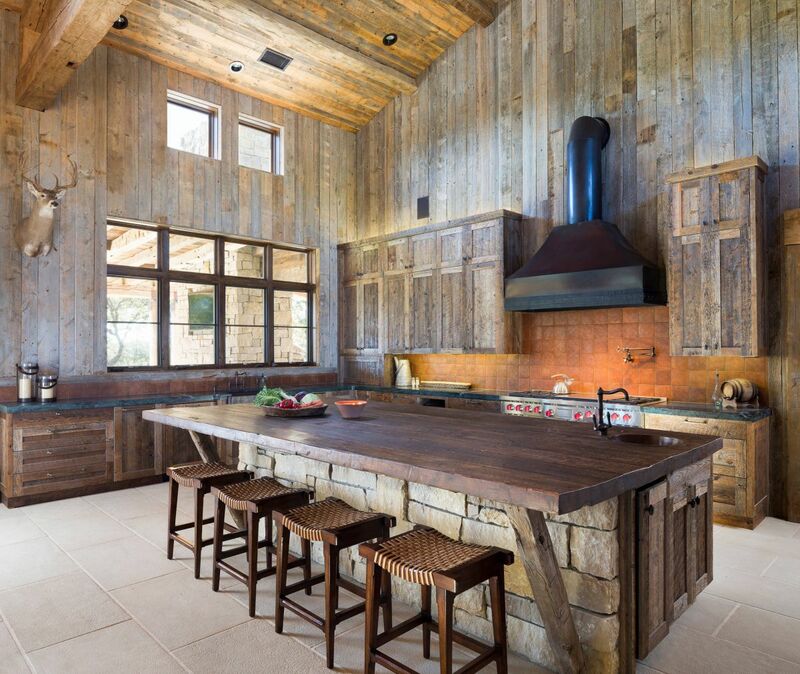 Building a rustic home with vertical wooden shiplap wall and furnishing your kitchen with rustic furniture? Well, this stone kitchen island with wooden countertop can be a perfect idea. Maximize the space of your kitchen by choosing kitchen island with breakfast bar, and add some rattan chairs in your kitchen to define the rustic look. It looks like a home sweet home in the country, right? Wanna try this idea? White is never boring. It is gonna be a perfect color for your minimalist kitchen. 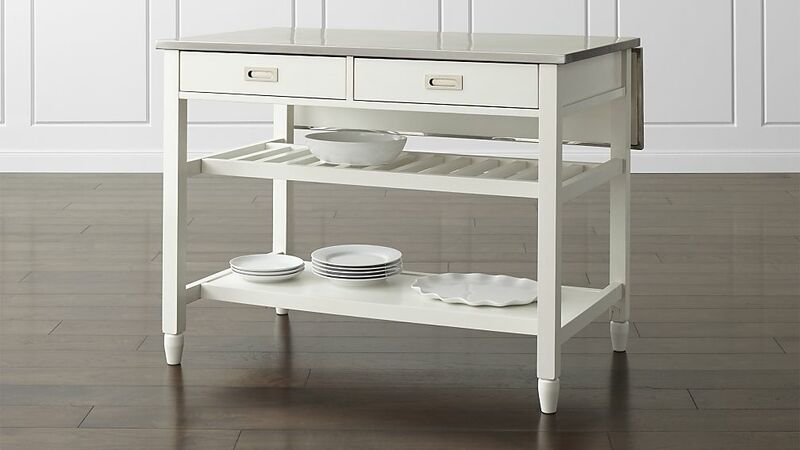 A white kitchen island with brakfast bar can be a great addition in your kitchen. It is gonna be a perfect place to prepare your food and have your meal with your significant other. 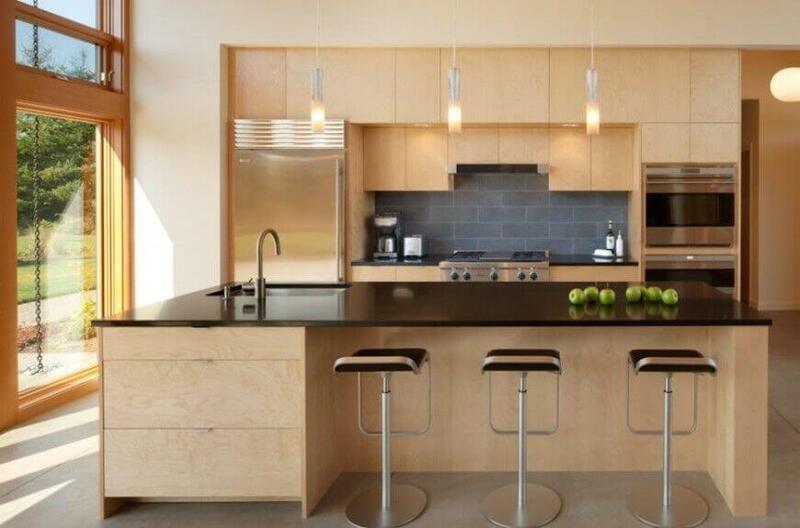 A pair of black chairs can be a perfect addition for your kitchen island too. What do you think? Wanna try this idea? A tiny kitchen island can be a great addition in your kitchen. Especially if you want a nice place to enjoy your coffee and have a little chit chat with your special someone. If you have already designed your kitchen in white, furnished your kitchen with white cabinets, and painted the room with white paint, a white kitchen island with wooden countertop can be a perfect idea. So, feeling like to try this idea? If the reason why do you need a kitchen island is for dining, then this kitchen island idea is gonna be a perfect idea for you. You can choose a white kitchen island with storage and granite countertop. You can store your favorite comic books in the storage, so you can enjoy your coffee while reading your favorite book in the morning. 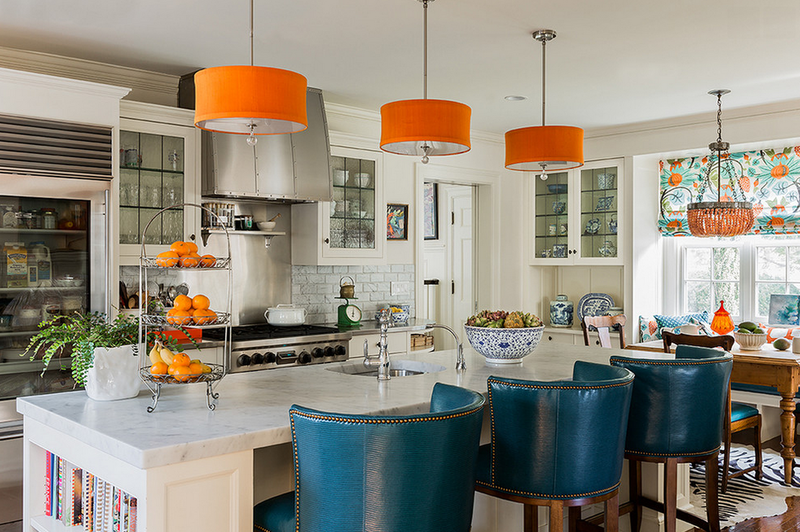 A little decoration on the ceiling right above the island can be perfect too, such as these orange lamps. Looks like a perfect place to have your dinner, right? What do you think? 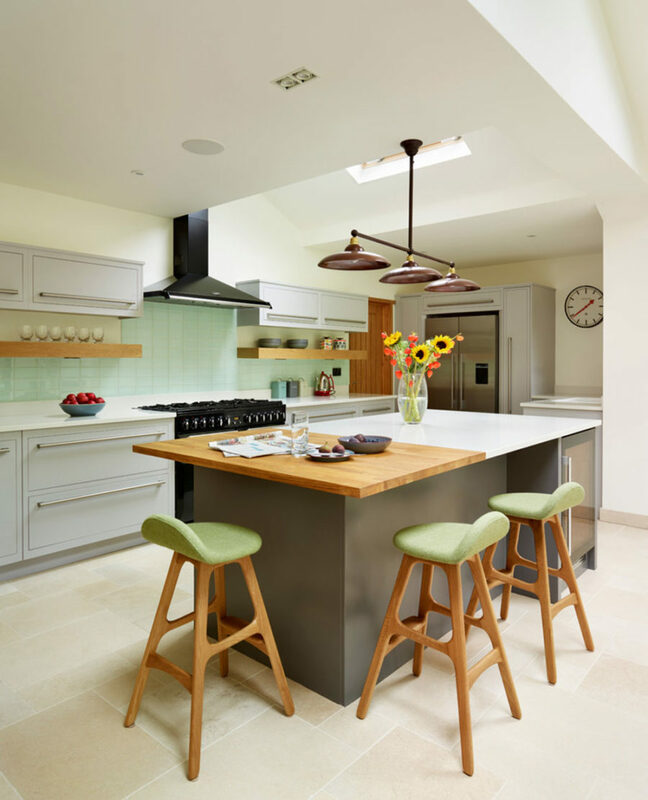 Looking for the perfect kitchen island for your wide kitchen? Well, this kitchen island with breakfast bar is gonna be a perfect idea for you. Your kitchen will not only be a comfortable place to cook but also the best place to have your dinner. 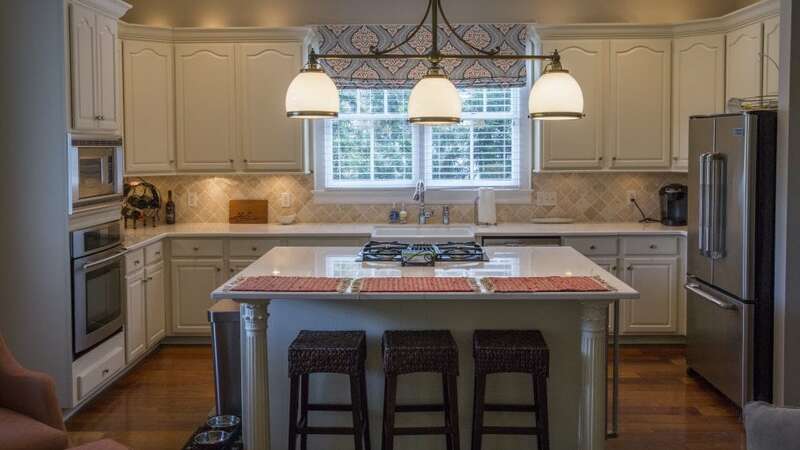 You can decorate the ceiling with white pendant lighting right above the island too. It looks like a romantic place to have a dinner at home, right? Wanna try this idea? If you want to have a multifunctional kitchen island that can be use to prepare your food, cook your meal, and eat your breakfast, this kitchen island with stove can be a perfect idea. You can buy a set of kitchen furniture, including the kitchen cabinets to get the perfect look too. If you are designing your kitchen in rustic style and want to keep the traditional look in your kitchen, you can choose the cabinets with five-piece fronts. Do you want an unusal kitchen island for your kitchen? Well, this kitchen island can be the perfect choice for you. Add a pair of vintage chairs to your kitchen island, and don’t forget to decorate it with flowers or green plants. It looks great, right? What do you think about it? Wanna try this idea? 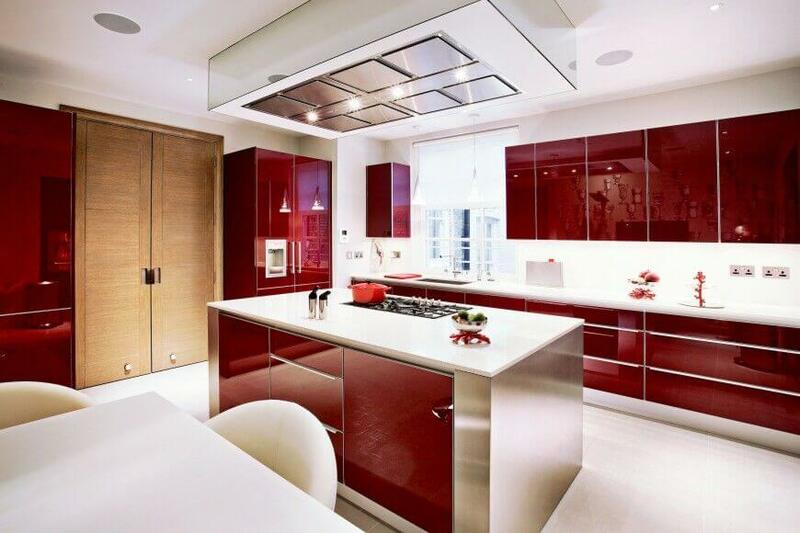 Do you want to have a kitchen with bold red? Well, this idea will be perfect for you. 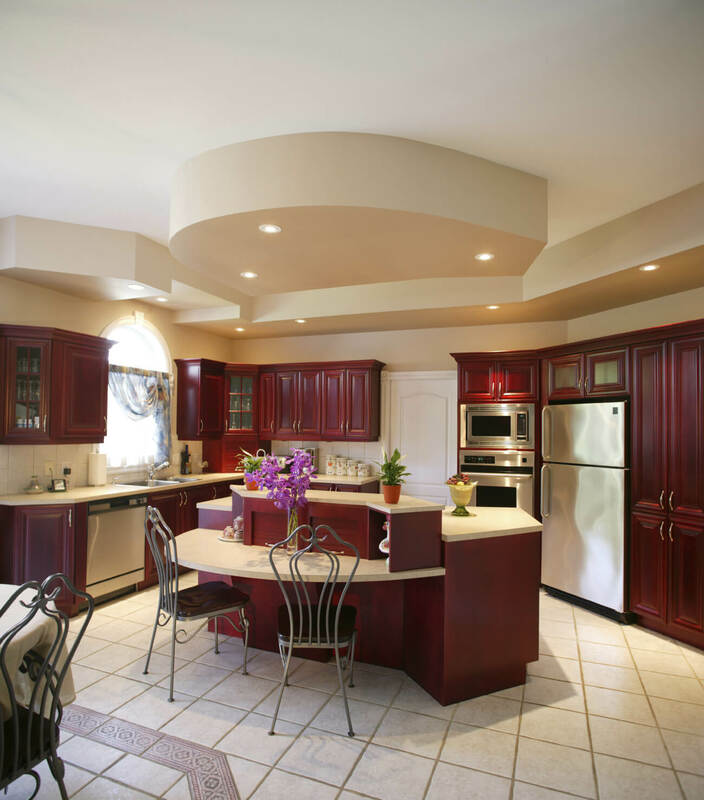 You can choose red kitchen island and red kitchen cabinets for your kitchen. 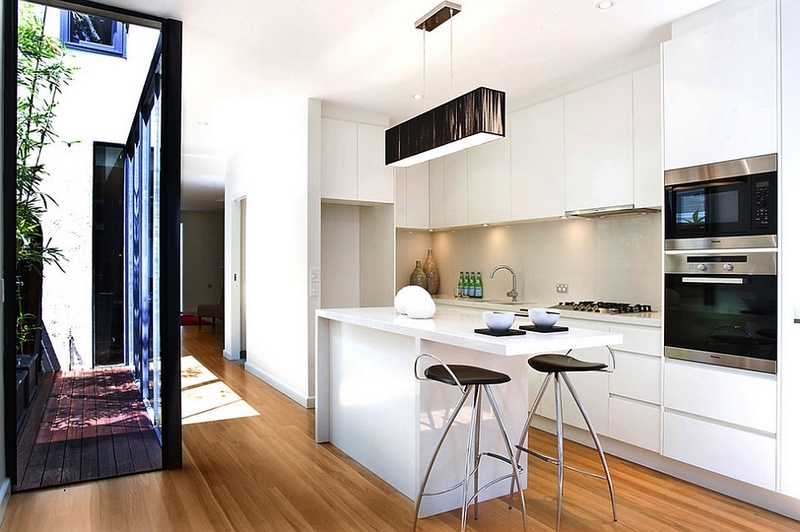 To make the kitchen looks more luxurious, you can add a modern lighting on the ceiling. What do you think about it? Wanna try this idea? Designing a black and white kitchen? Well, this white kitchen island is gonna be a perfect furniture to prepare your food. This idea is perfect for you who does not have too much space in your kitchen but need a kitchen island for food preparation. Since you won’t need the island for dining, you can choose white kitchen island without breakfast bar. Looks great, right? What do you think? Wanna try this idea? Need a compact kitchen design that can be used as a dining room too? This cool kitchen furniture idea is gonna be perfect for you. Choose wooden kitchen cabinets and wooden kitchen island with sink to make food preparation easier for you. Add a little decoration to the ceiling by adding pendant lamps. Want to have a lovely kitchen? 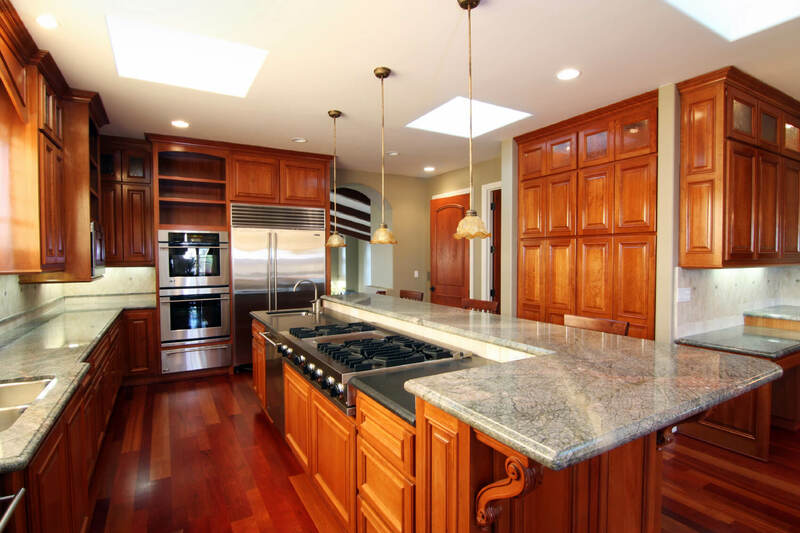 Choosing wooden cabinets and kitchen island can be a good idea. You can choose kitchen island with black granite countertop and a sink to make food preparation easier for you. 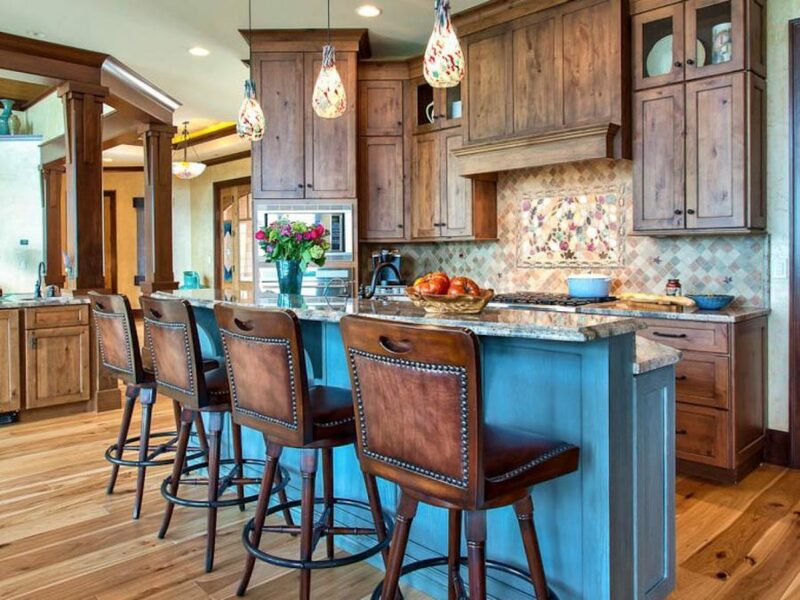 Add some seats to the kitchen island and enjoy your delicious breakfast everyday. This idea is perfect for you who have a kitchen with good lighting. So, wanna try this idea? 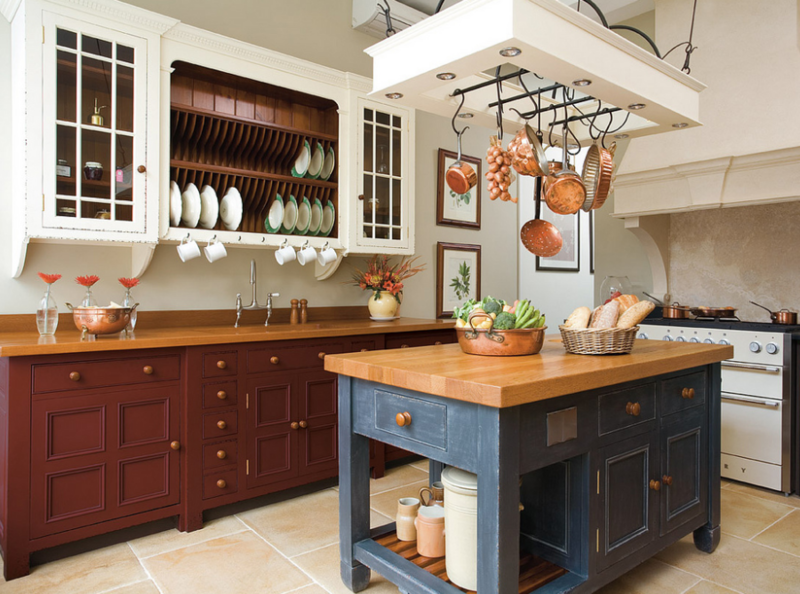 Kitchen island with ornaments and white-bone color will be a perfect choice if you want to have an antique kitchen. You can enhance the antique look by installing antique ceramic tiles and antique chandelier. Don’t forget to choose appliances with neutral colors such as refrigerator and stove with gray color. Declaring your self as an atique style lover? Why don’t you try this idea? Want to keep your kitchen simple and match it with your simple personality? 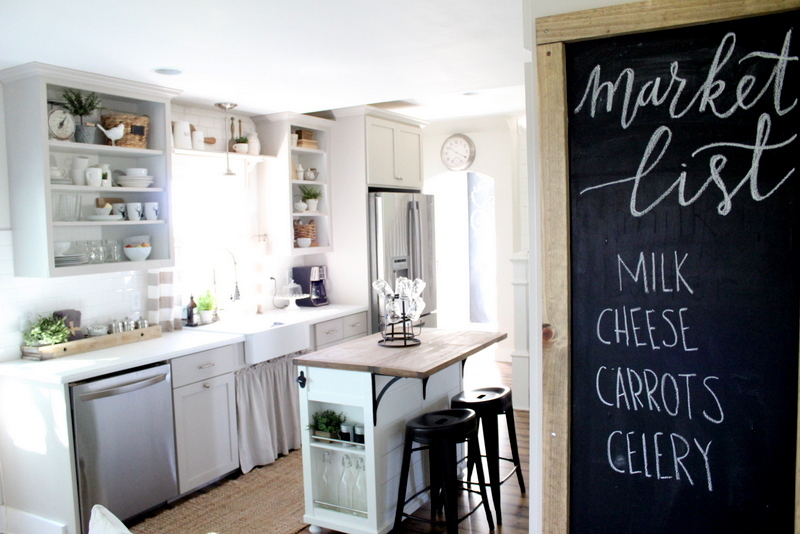 This simple kitchen island idea is gonna be perfect for you. Instead of setting it in the center of the room, you can set it near the wall. Choosing a brighter color such as bright white can be a perfect choice if you are designing your room in gray color palette. 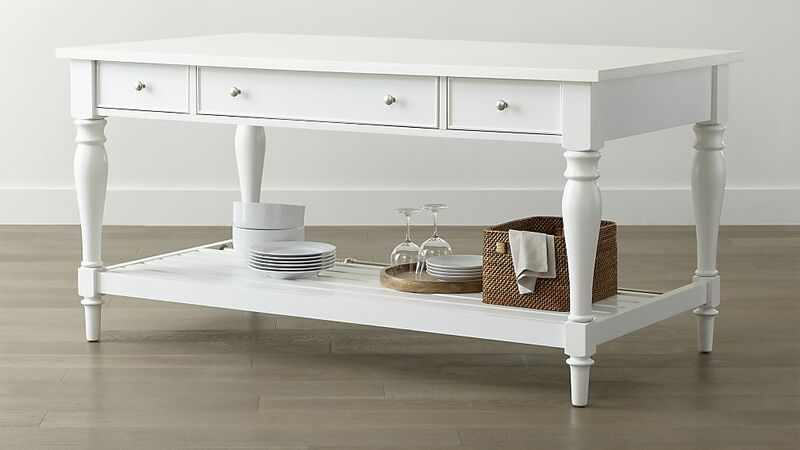 So, what do you think about this simple kitchen island? Wanna try this idea? White is elegant. 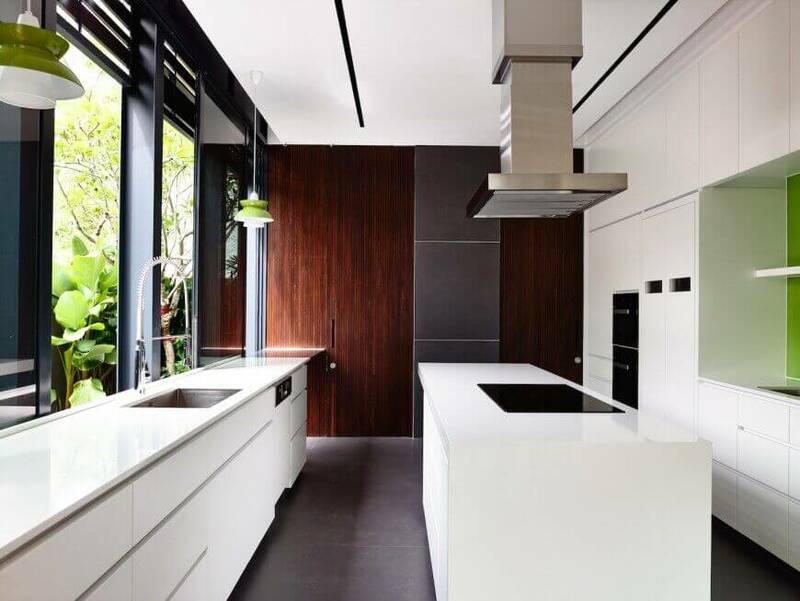 That is why choosing white kicthen island and white kitchen cabinets can be a good choice for you if you want to bring elegance in your kitchen. Choose a multifunctional kitchen island that can be used for food preparation and dining as well. Add some unique chairs. And enjoy your delicious meal everyday. What do you think about this idea? Wanna try this idea too? 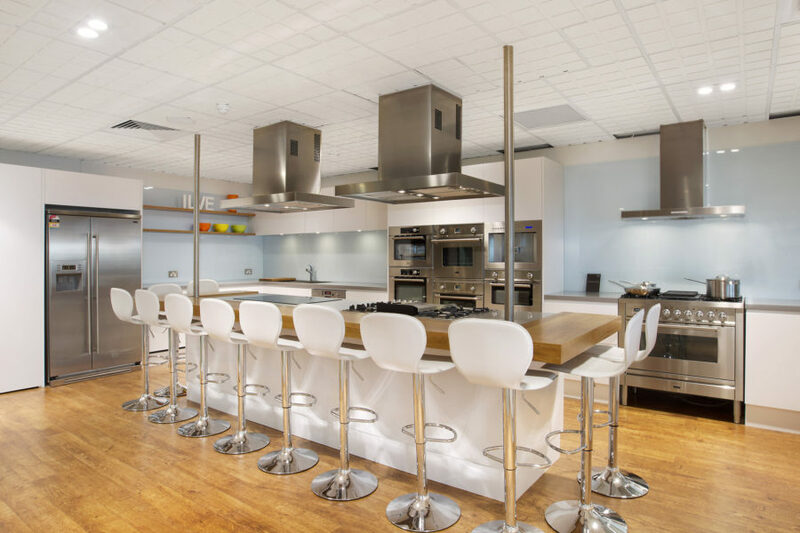 Only need a kitchen island for food preparation? Well, no need for a big kitchen island. 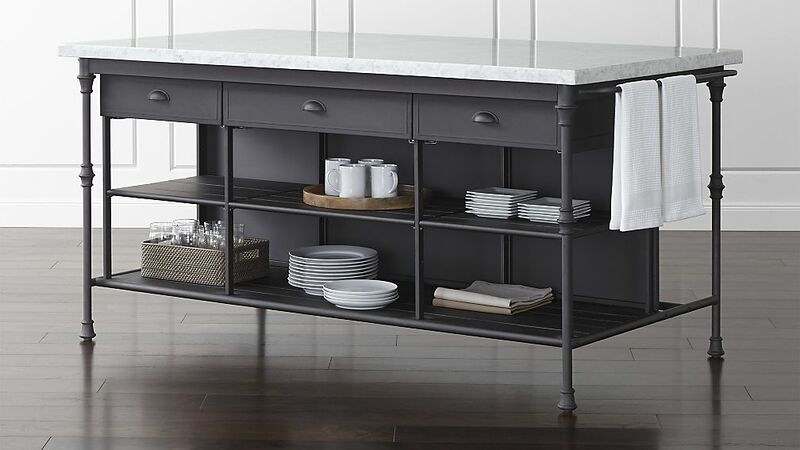 You can choose this little kitchen island that has some space to store your dining set. This kitchen island will be a good idea if you only have a small kitchen but do need a kitchen island to prepare your meal. So, do you think it is gonna be a perfect additional furniture for your room? This kitchen island is perfect for your black and white kitchen. You can use it for food preparation and to store your dining set as well. Since it is not too large, it is gonna be great for your minimalist kitchen. Set it in the center of the room and enjoy cooking everyday. 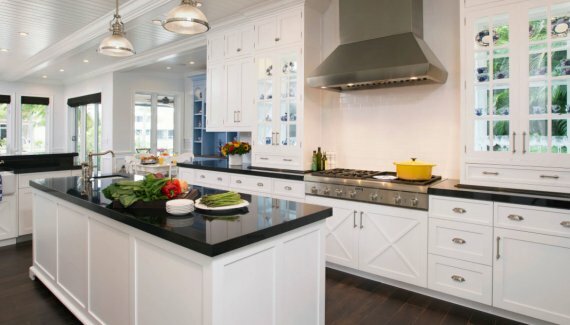 Do you have a black and white kitchen? Wanna try this idea? This kitchen island idea is perfect for you who need a kitchen island but do not have too much space in your kitchen. If you have already designed your kitchen in white, then you can choose this white kitchen island with granite countertop. Do you think it is gonna be a perfect furniture for your kitchen? If you need a kitchen island only for food preparation, you don’t really need a big kitchen island. You can choose this little kitchen island that has some space to store your dining set. This kitchen island will be a good idea if you only have a small kitchen but do need a kitchen island to prepare your meal. 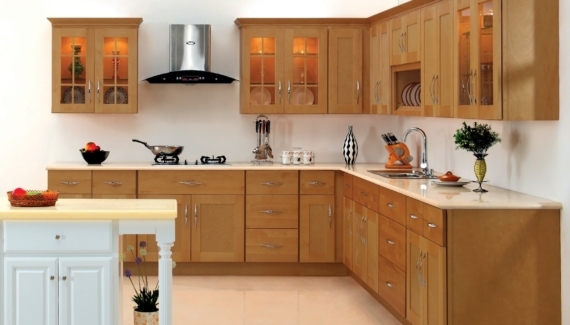 Choose kitchen island with five-piece fronts for your traditional kitchen. Lighting is the best solution to have a dream kitchen design. 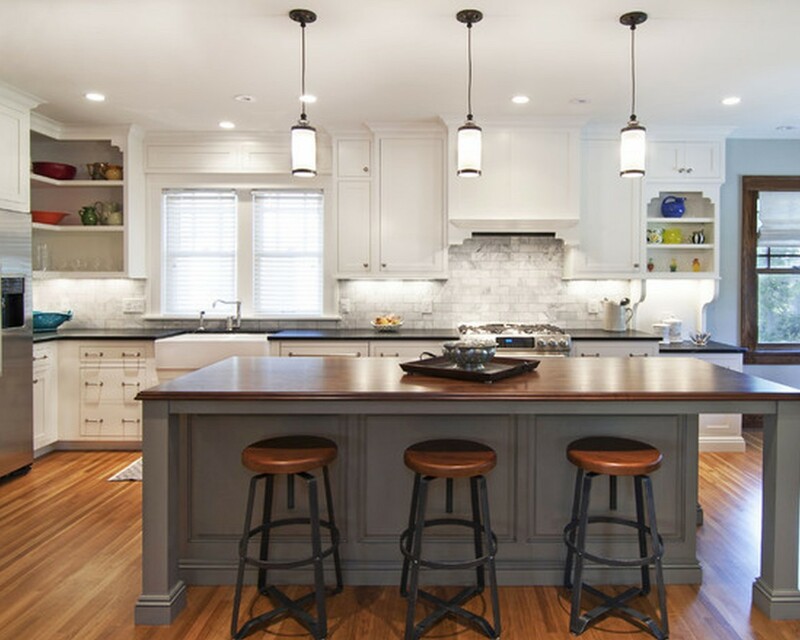 You can install some pendant lights on the ceiling right above your kitchen island to make your kitchen looks more elegant. Choosing the perfect kitchen island is something you cannot miss too. 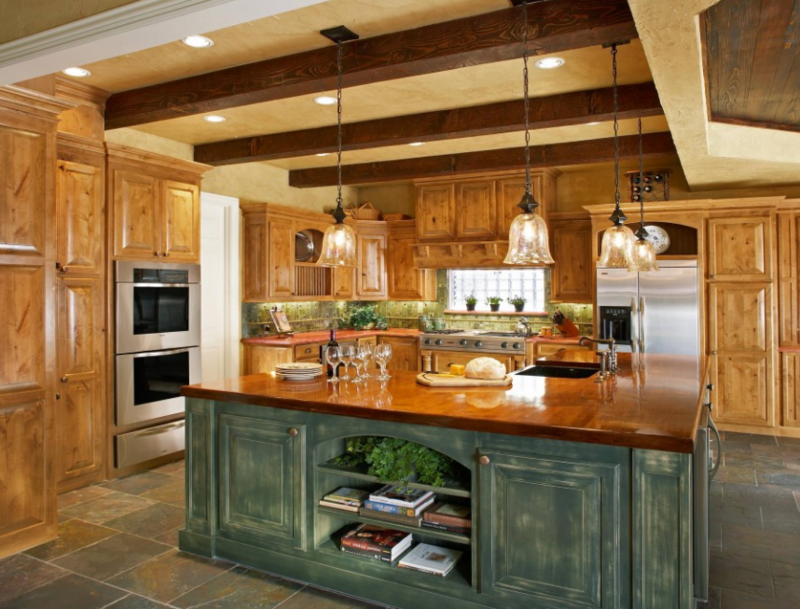 You can choose kitchen island with wooden countertop for your rustic kitchen. So, rustic kitchen lovers, wanna try this idea? 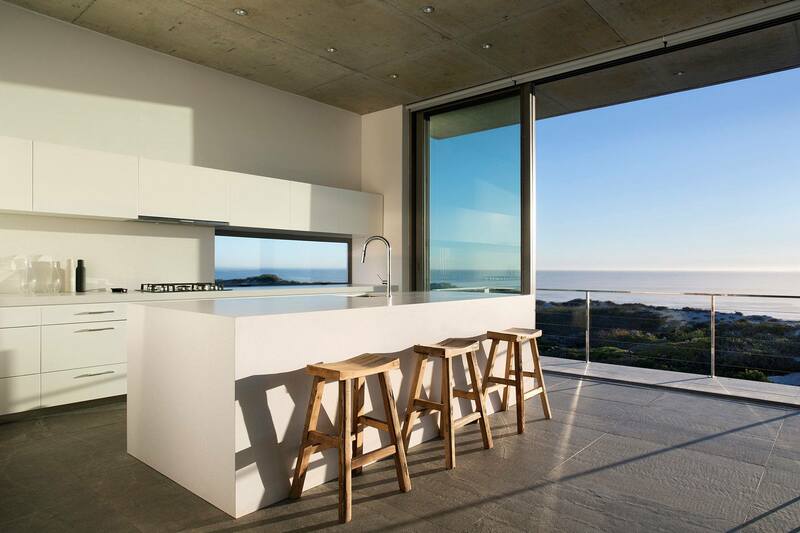 Want to have a multifunctional kitchen island? You can choose this kitchen island with stove and seating. It is gonna be a perfect place to enjoy cooking and eating your meal everyday. If you are designing your kitchen in rustic style, a wooden kitchen island with granite countertop can be a perfect idea. So, do you think you should try this idea? Who says you need to match the color of your kitchen island with the cabinets color. Actually, you can bring a brand new color to your kitchen by choosing a color which is not in your kitchen color palette. 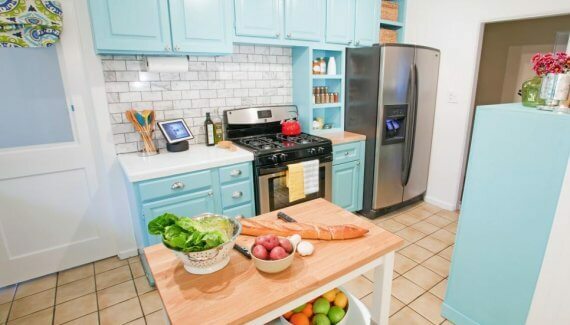 You can choose a blue-denim kitchen island with wooden countertop. Right above the kitchen island, you can hang your cooking tools such as fry pans, and many others. It looks unique, right? Do you think you should try this idea? 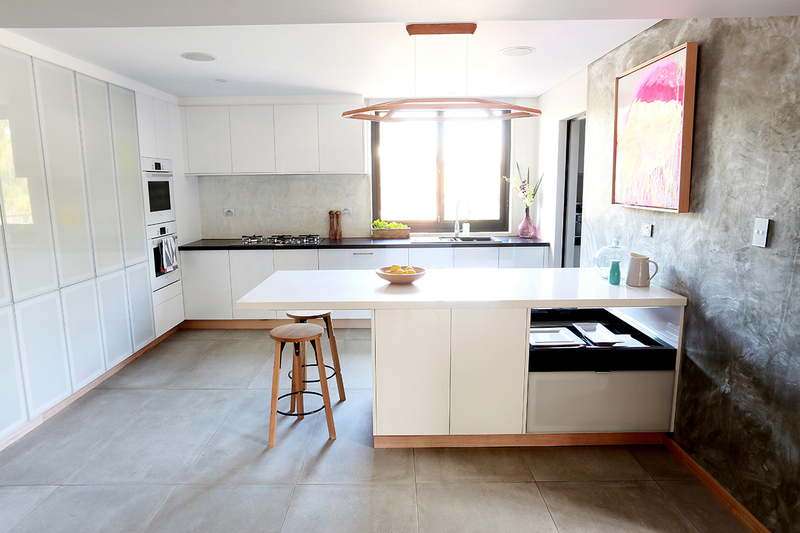 White kitchen island is the best choice if you don’t have a good lighting in your kitchen. It is gonna look great when it is paired with some rattan chairs and silver kitchen appliances too. White color can be a smart choice too if your kitchen is small and you want to make it looks a little bit roomier. Do you think it is gonna be a good choice for your kitchen? Who says rustic style lovers has limited option when they need to furnish their rooms? You don’t have to choose white kitchen island or unpainted wooden kitchen island if you want to choose a brighter furniture for your kitchen without losing the rustic look. 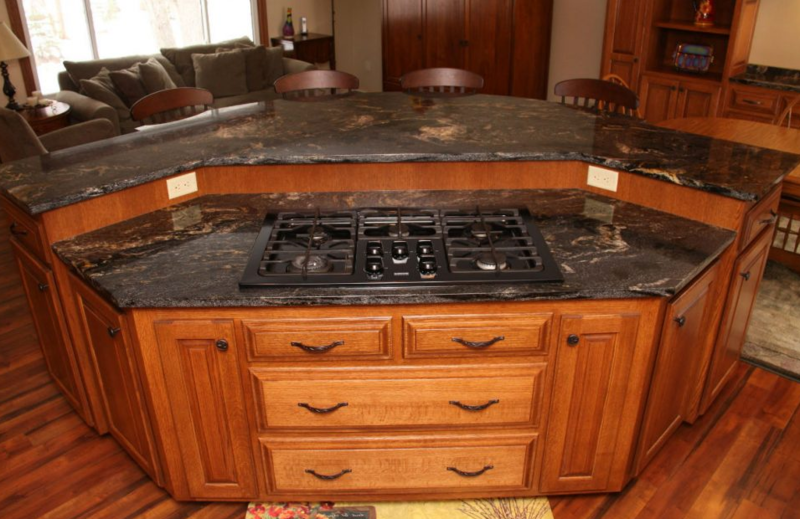 You can choose this blue kitchen island with granite countertop. 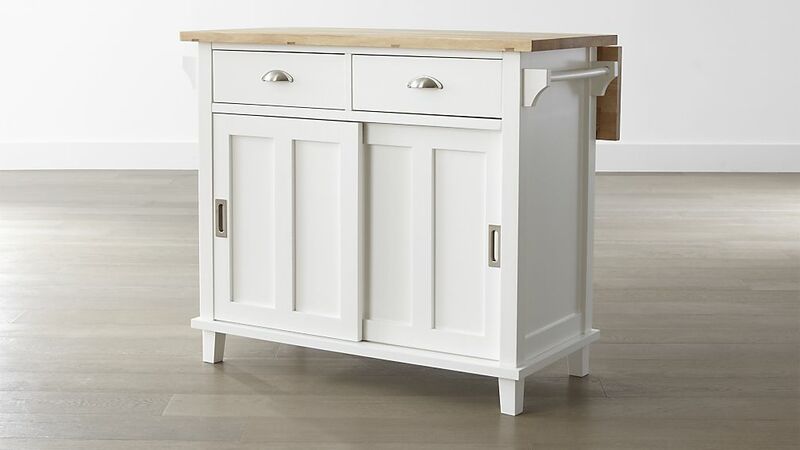 This kitchen island will look great when it is paired with some wooden chairs. So, wanna try this unusual idea? Who says kitchen island only can be a dining table for a couple or three persons? You can enjoy your meal with your big family if you choose this kitchen island. 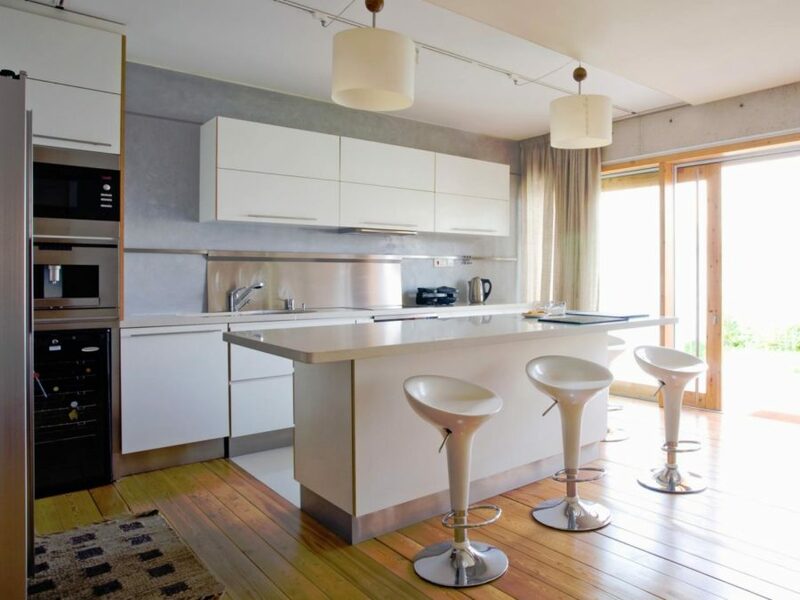 If you are designing your kitchen with white color palette, you can choose white kitchen island with wooden countertop. It looks great right? So, wanna bring your entire family to dinner or throwing a little party with your friends? Looking for a unique kitchen island which is gonna be great for food preparation and dining too? Well, maybe you should try this idea. You can choose a gray kitchen island with two different countertops, wooden countertop and white countertop. To make your kitchen looks more unique, you can install a tripple-lamp decoration on the ceiling right above the kitchen island. What do you think about this idea? Wanna try it? Want a simple kitchen island for your kitchen but don’t want your kitchen loses its elegance? Well, this simple kitchen island can be perfect for you. To make your kitchen looks more elegant, you can add some unique chairs to the kitchen island. A pair of lamp lanterns can be great decoration too. This silver kitchen island with seating is gonna be a perfect furniture for you who want to design your kitchen in gray color palette. 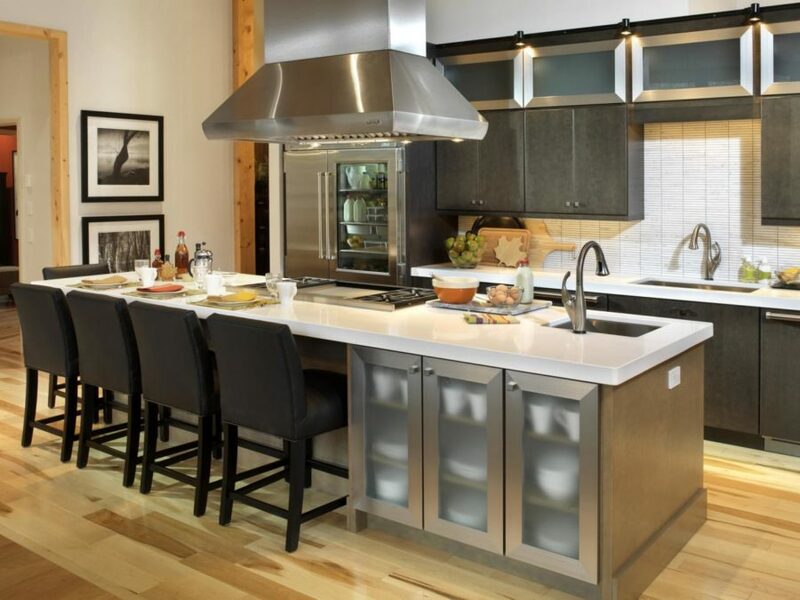 You can choose silver kitchen island with white countertop, stove, and sink and pair it with some black chairs. It is gonna be perfect for your gray kitchen. Are you designing your kitchen in gray? This idea is gonna be perfect for you. 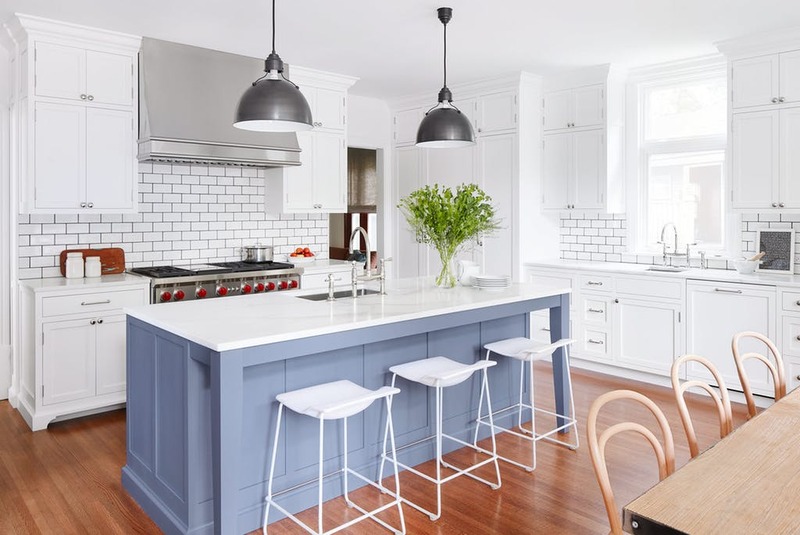 Designing your kitchen in white color palette? Instead of buying a white kitchen island, why don’t you try to make your kitchen stand out by adding a blue kitchen island into your kitchen? You can choose a blue-denim kitchen island with seating. Since your kitchen is designed in white color palette, some white chairs can be perfect pairs for your kitchen island too. Don’t forget to decorate the kitchen island with green plants to make your kitchen look fresh. What do you think about it? Wanna try this idea? That was the list of 30 kitchen island ideas for a cook wanna be. Kitchen island might not be the most important furniture for your kitchen. But, for people who like cooking, especially cooking for a big party, it is a must-have furniture. So, which idea do you like the most? Do share your answer with us in the comment section.